Roland brought his own passion for agriculture to the family operation and played a major role in shaping the future of the farm. 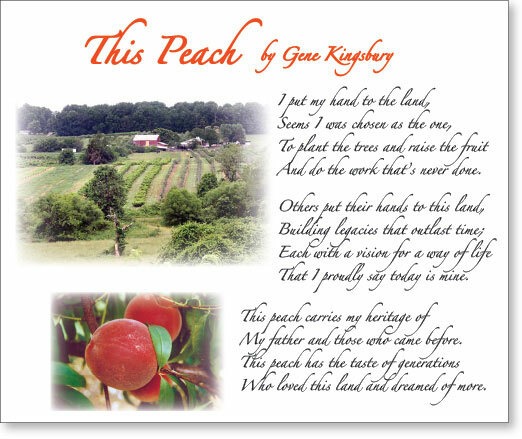 Today, Peggy’s son and daughter -- Gene Kingsbury and Sue Ketron -- continue to watch over the legacy passed along by their great grandfather, and they have expanded the orchard by adding apples, pears, nectarines, apricots and plums. We are especially fond of white peaches and nectarines, which have become a specialty at our orchard. 200 trees. The Kingsbury Pride peach will be available for sale at our orchard on August 14. We hope you will try it this season and let us know what you think. Thank you for visiting our web site and for supporting family farming in Montgomery County. looked like the perfect place to live and raise a family. For 25 years, the Horine family farmed the land in a very traditional way, as thousands of farm families did during that era. In 1932, Phil Horine, the eldest son, had an idea to help his farm family weather the Depression – PEACHES!! While not commonly grown in the area, Phil introduced peaches to the community and found that the trees flourished and produced fruit with a distinctively sweet flavor.